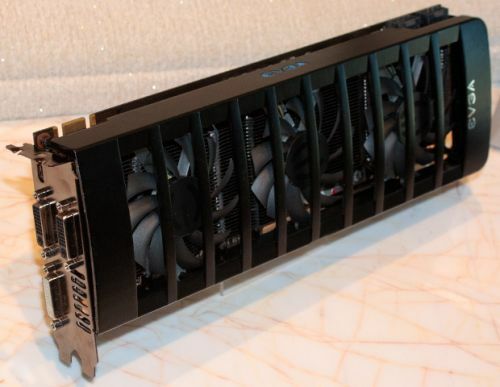 EVGA has announced during the CES 2011, that a dual-GPU graphics card (EVGA’s Gemini project) will be released soon. No much information about what GPUs will be used, but the GPU behind the upcomming GTX 560 is a good candidate. The Gemini card (or GTX 590 ?) comes with two 8-pin PCI-Express power connectors (ouch! 50W+150W+75W which means a maximal power of 375W…), three DVI outputs and one SLI connector. two 8-pin power connectors isn’t that bad compared to quad 6-pin power connectors for two single gpu cards. Woah! Nice! I want one! Exhausting the hot air of such a high caliber card, inside the case, is not a wise choice! SLI two blower type cards and be done with it! This looks pretty awesome – but I agree with the previous two posters that not everyone is going to have five 120mm exhaust fans on a super-tower E-ATX case to get rid of all that heat. That this is an EVGA card suggests that board vendors already have stock to distribute. It shouldn’t be long till it’s released, though I wouldn’t be able to run a fan with that cooler in my case.